Spring is a special time of the year to host a wedding. With our gardens blooming, birds chirping and beautiful flowers available, it is a blissful season to celebrate your love. During this time of year, our pricing varies through mid-season and peak pricing, offering a range of per-person prices and minimum guest numbers. As the warmer weather comes upon us, you are able to make use of any of our garden ceremony locations or our covered courtyard area. 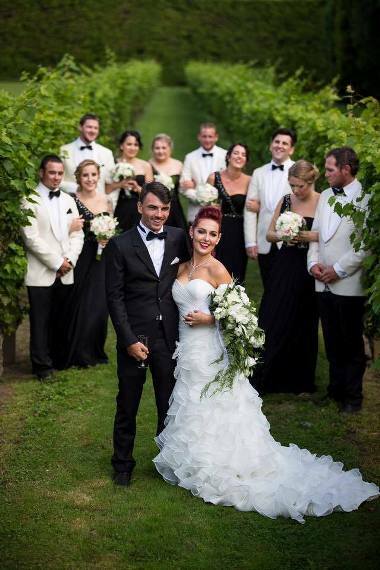 Markovina estate was a stunning venue for our wedding especially with its lush gardens, spacious hall and its hanging vines, and so many amazing locations to have your wedding ceremony. The service from Rina, yourself and the team at Markovina was just amazing..
Easy organization around the food and alcohol made it easy for us to relax on the day, knowing that all of that was paid for and no stress about adding on money to the bar. Markovina is a dream venue with staff, food and atmosphere to match. I had a lot of people telling me that it was one of the best and well organised weddings they had ever been too and even my cousin who is a chef said it was some of the best food he has ever had. Rina was amazing on the day, always checking if we were ok and just made us feel so amazing. Our wedding was magical and the service provided was excellent. The staff are very nice and check that everyone is enjoying themselves and happy regularly. The venue is absolutely beautiful and has so many different places to take photos or celebrate the wedding.